A Beautiful and Elegant Estate Platinum (stamped) Engagement Ring with GIA Certified 1.10ct Radiant Center Diamond in H color VS2 clarity (Near Colorless and Eye Clear). The measurements of the Center Stone are 6.76x5.51x3.50mm. 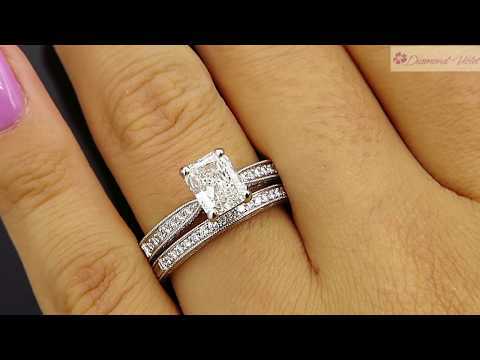 It is set into Beautifully Engraved Handmade Mounting with diamonds on the band; estimated total weight is 0.27ct; H-I color, VS-SI clarity overall. Sits nice from the top of the finger – 7.56mm. The split band tapers from 2.23mm to 2.33mm on the bottom; the weight is 6.06 grams, Solid. Finger size 6 ¾, can be re-sized. We offer FREE sizing with purchase. The Engagement ring comes with matching Diamond Wedding Band in 18k White Gold; estimated total weight is 0.33ct. Finger size is 6 ¾, the weight is 3.15 grams; sits nice from the top of the finger 1.76mm. Hallmarks: PLAT, 18k, maker’s mark. Great Mint condition, minor evidence of wear in form of tiny scratches to the metal. Polished, ready to wear. Money back minus shipping. Buyer must notify seller within 3 days of the items receipt of his/her intent to return.